Leo Klinstein, Director of Engineering at Dukane Corporation recently spoke at the 2012 UIA 41st Annual Symposium in San Fransisco, CA. The UIA Symposium is a 3-day symposium that provides a networking opportunity for ultrasonic professionals and colleagues throughout the world. There is time for informal networking each day as well as outstanding presentations on the latest in ultrasonics. Leo gave an overview of the ultrasonic plastics welding process in a 1.5 hour workshop session – “Fundamentals of the Ultrasonic Plastic Welding and Practical Equipment Demonstration”. It was a presentation and a hands-on use of an ultrasonic system. Ultrasonic pneumatic‐driven plastics welders and advanced servo‐driven welders were discussed. 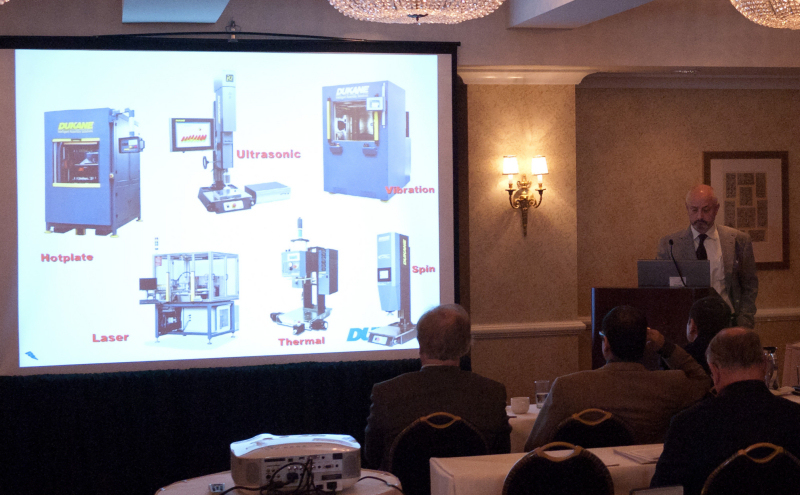 Participants were provided an opportunity to view practical ultrasonic welding with an industrial servo welding system on‐site at the symposium. Other highlights of the symposium included how ultrasound is being used in therapeutic treatments of diseases such as cancers, removal of bone in approaches to tumors and aneurisms in the brain, drilling and sampling of soil and rock in extraterrestrial applications such as exploring planets for life, improving efficacy in sustainability applications such as creating biofuels, and advancing methods of joining and welding of semiconductors and polymers. UIA Symposium technical programs attempt to highlight scientific and engineering methods utilizing ultrasonic power to change materials in very positive ways.